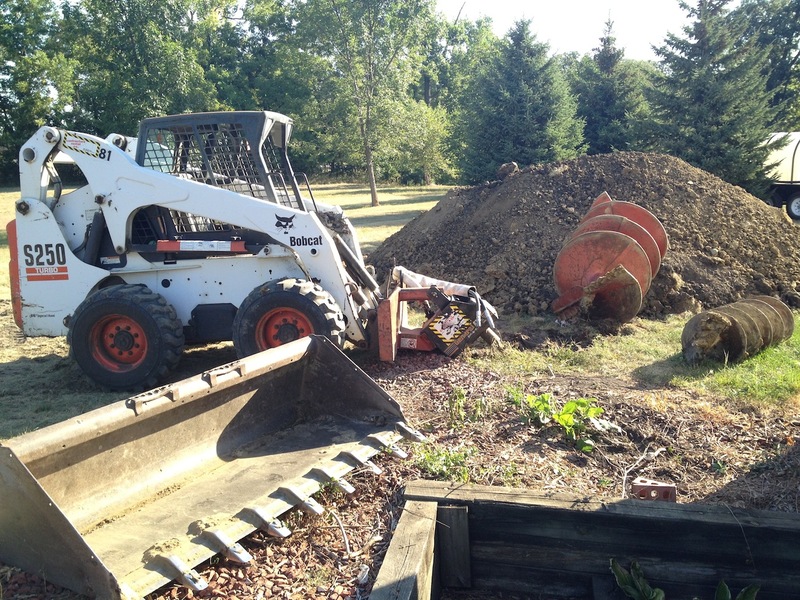 We interrupt our regularly scheduled programming of activities associated with our $70,000 Dream Backyard Makeover project…to explain the interruption. 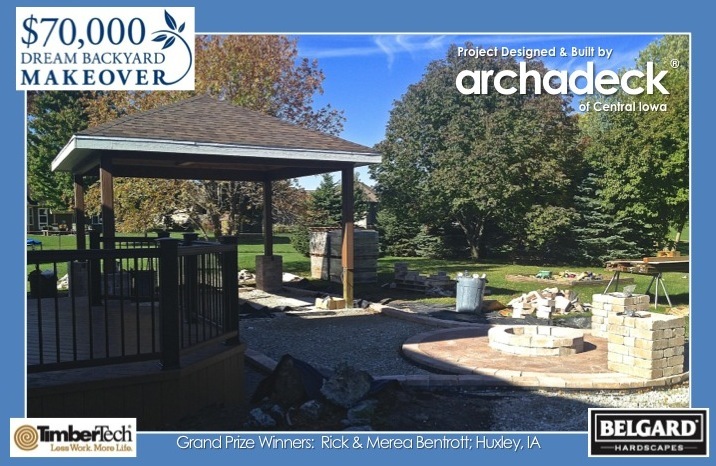 At the time of our last writing here (September 6th), we had just broken ground on Rick and Merea Bentrott’s grand prize-winning outdoor living space project up the road from Des Moines in Huxley, IA. 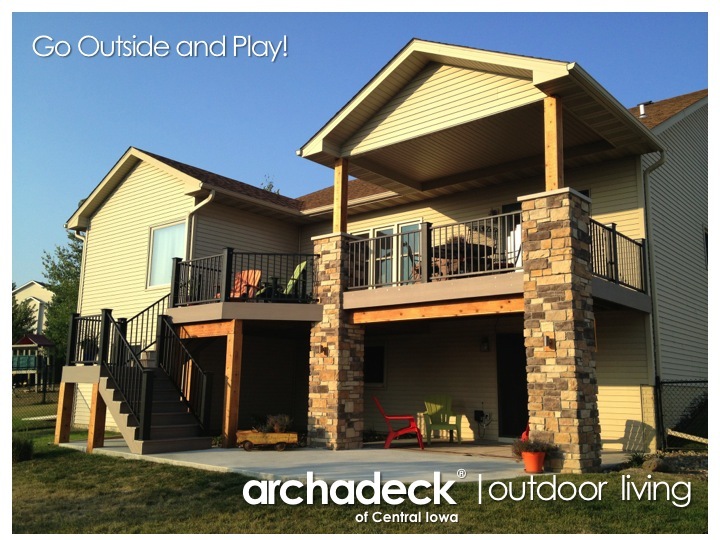 Over the course of the past month, I’ve posted a photo album on our Archadeck of Central Iowa Facebook page as a journal of our progress on the deck, porch and patio aspects of the project. 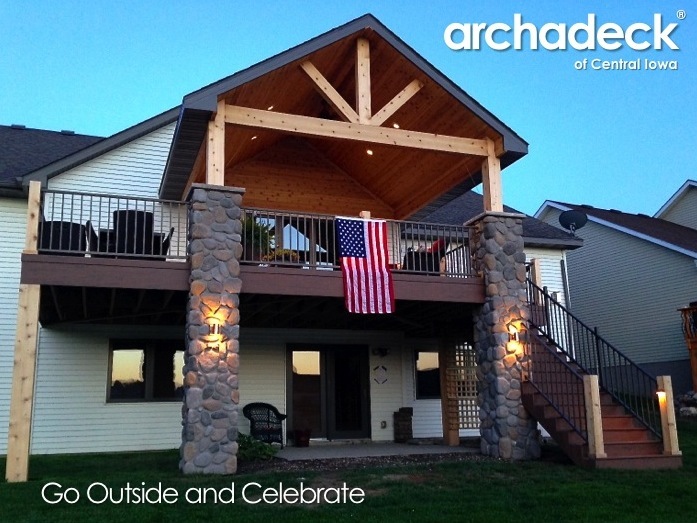 Additionally, I’ve taken videos of the project space as its progressed; you’ll find those on our Facebook page as well as on our Google Plus pages and on our ArchadeckCentralIowa YouTube channel. We had planned to be completed with the project by now so I’m not sure if these lags and delays are more frustrating for the Bentrott’s or for me. Probably for the Bentrott’s. At least I have the advantage of experience on my side. 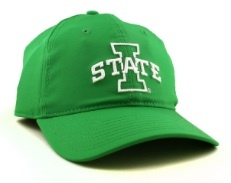 If you want to call it an advantage. 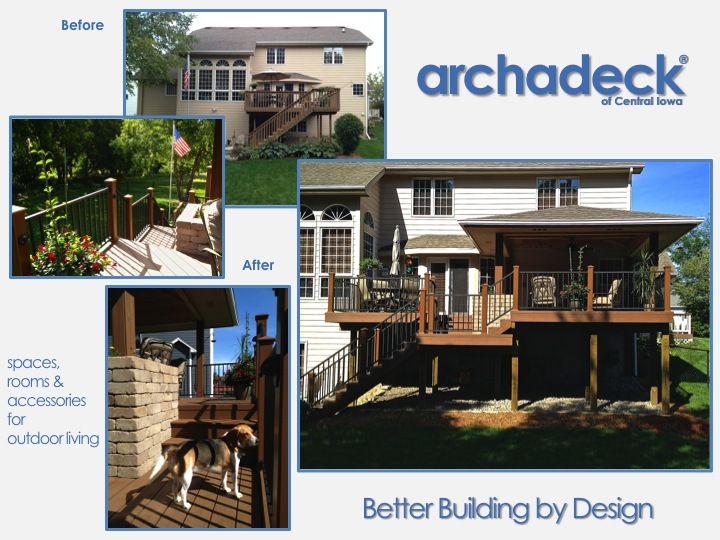 Unfortunately, this project is not the only project experiencing what I have come to call “supply channel issues.” There are a lot of moving parts on many of our projects – particularly those involving combinations of outdoor living components – decks, porches, patios, outdoor kitchens, pergolas and more – like the Bentrott’s project. Getting the right material and product to the right project at the right time has become a more prevalent challenge these days. 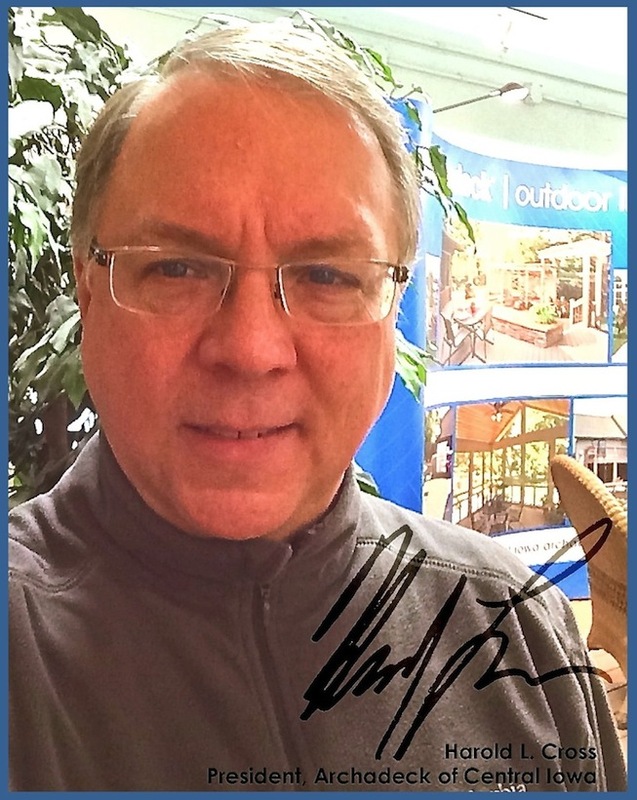 As I (and others) see it, this challenge is resulting from increased demand in the construction industry as a whole. But its an industry that took one of the hardest hits in the Great Recession, downsized to survive and is now facing challenges in ramping up to meet today’s demand. Strategies to expand infrastructure are clouded by lingering economic stability concerns and that is the primary factor in those challenges. As a result, many companies revert to strategies to protect existing margins…which often means: squeezing blood out of a turnip. And when you can’t do that anymore, you have to wait for more turnips to grow…and then they cost more. 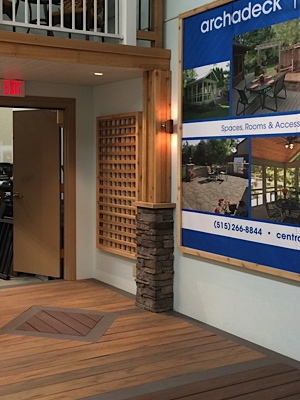 A recent Des Moines Register article about the construction industry and the impact a “healthier” economy is having on our business captures the current state of affairs in the construction industry. The article says the industry welcomes the challenges presented by growth. Speaking for myself , I certainly welcome the opportunities growth provides. 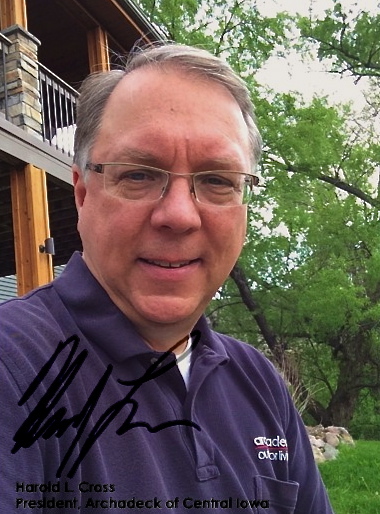 Speaking for myself and our clients, I think we’ll appreciate it more once the industry is ramped up to meet demand. 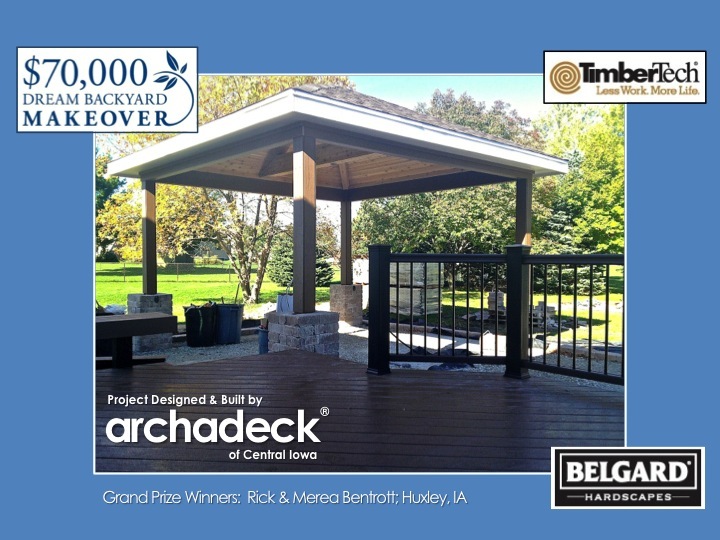 Not that I’m blaming “the industry” or any of our project sponsors (Belgard, TimberTech, Outdoor Living Brands/Archadeck). I’m not. 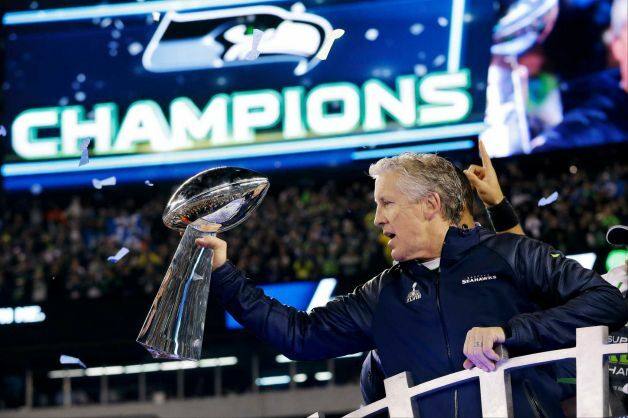 In fact, I’m a part of it….we’re all in it together. I have empathy for it. I have and feel the same pains. 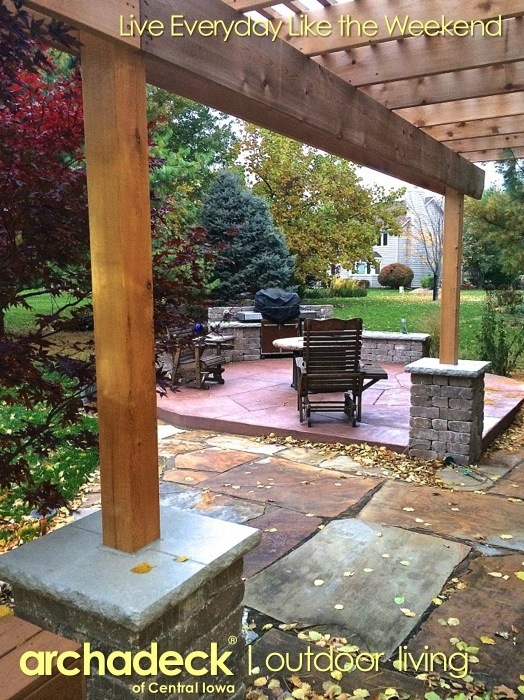 But, the outdoor kitchen is now not expected to be delivered until…take a deep breath…November 12th. 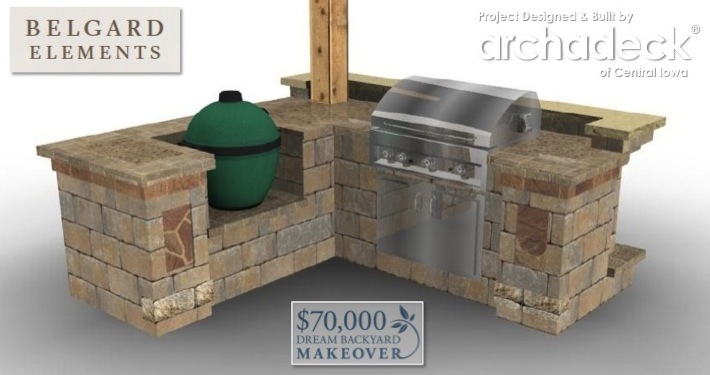 That is 3 – 4 weeks later than planned per original projections back in late August when the Bentrotts and our project sponsors finalized the project scope and design and the outdoor kitchen was subsequently ordered. As I’ve told the Bentrott’s, this extension now presents more questions than answers in regards to scheduling the completion of their project. Mother Nature and her weather whims are now the wild card in this. 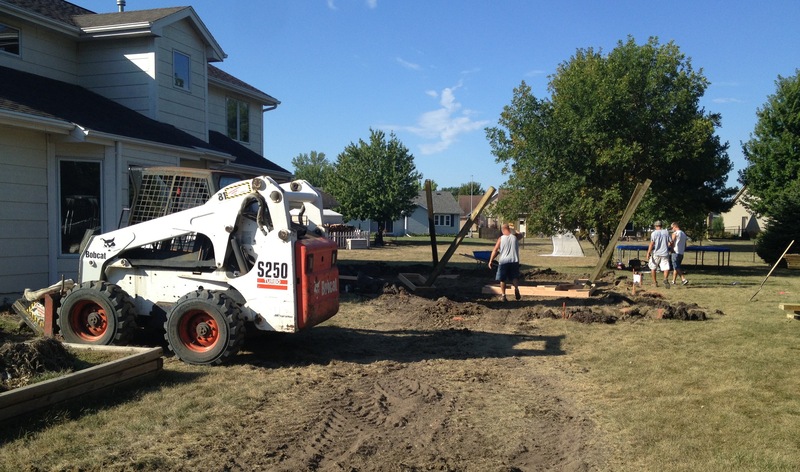 When the project started, I was touting the wonders and beauty of the Iowa dirt we were pulling out of the Bentrott’s backyard in preparation for the deck and porch footings and the excavation of the patio area. Here in Central Iowa, we’re now entering the seasons where that dirt gets pretty cold (frost) and hard (freeze)….and occasionally covered with snow…sometimes a lot of it…sometimes for long periods of time. 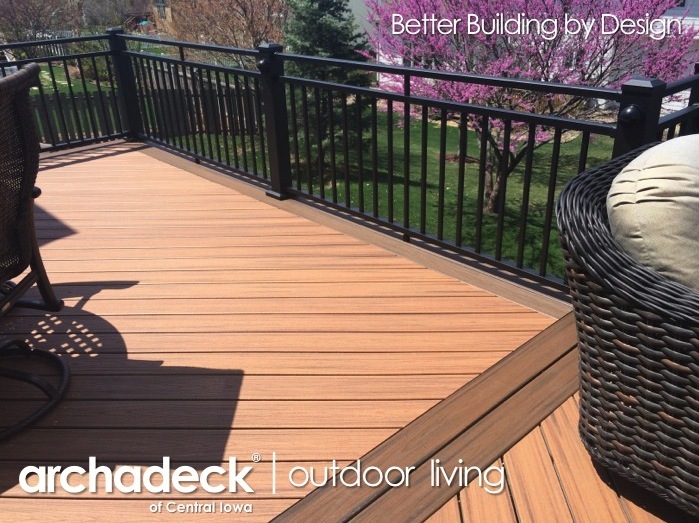 While that’s good for protecting Iowa ‘s precious soil and refueling its nutrients for next year’s crops, it’s not so good for laying patios. 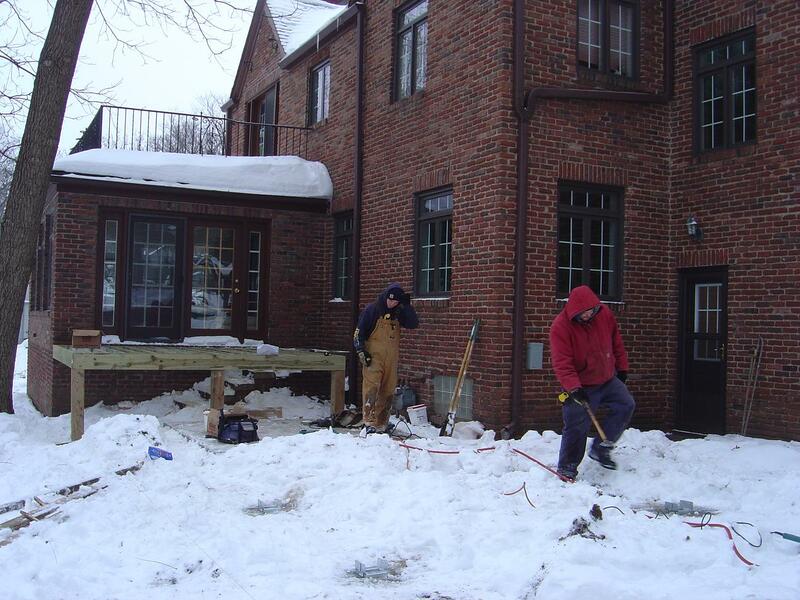 Decks and porches are more conducive to Winter builds; once the footings are in, those structures are built above ground….as long as temperatures are reasonable to work in (thank you, Carhartt!). 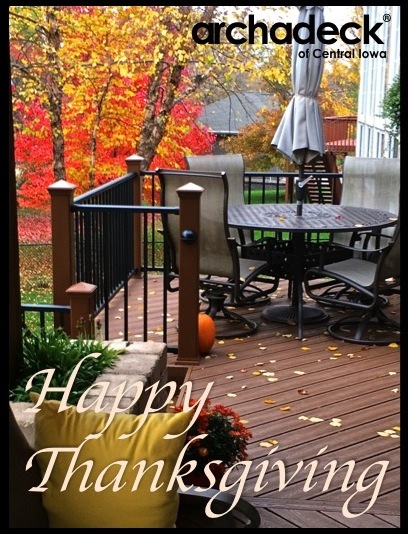 But, for the most part, the Bentrott’s deck and porch are completed. 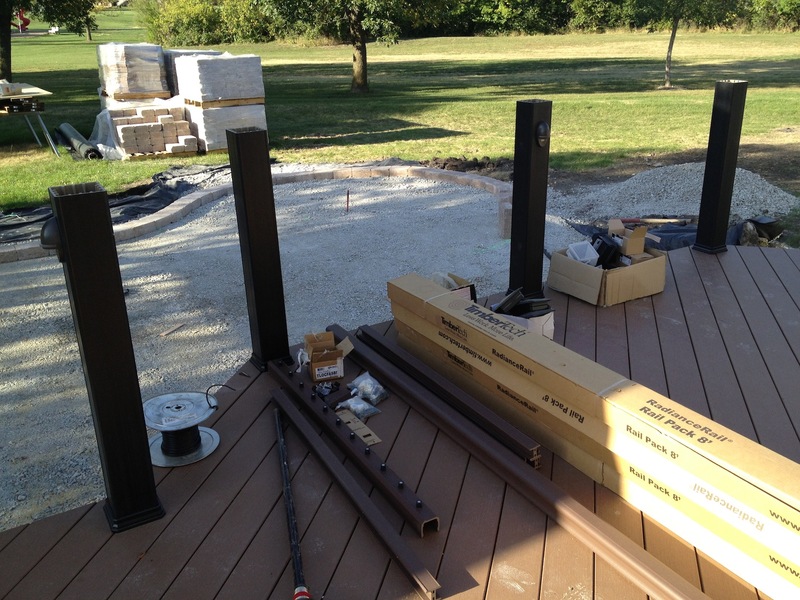 Our problem is the full patio installation needs to wait for the outdoor kitchen…and now we’re racing against an impending Iowa Winter. It’s a race we lose a step on every day now. Maybe two steps today…there was snow in the air and on the ground a few miles north of Huxley today. Frustrating. Even more frustrating? It last snowed here in Iowa in early May; meaning: we went less than 6 months between snow flakes falling on either side of “summer.” But, we love it here. We really do. Really. 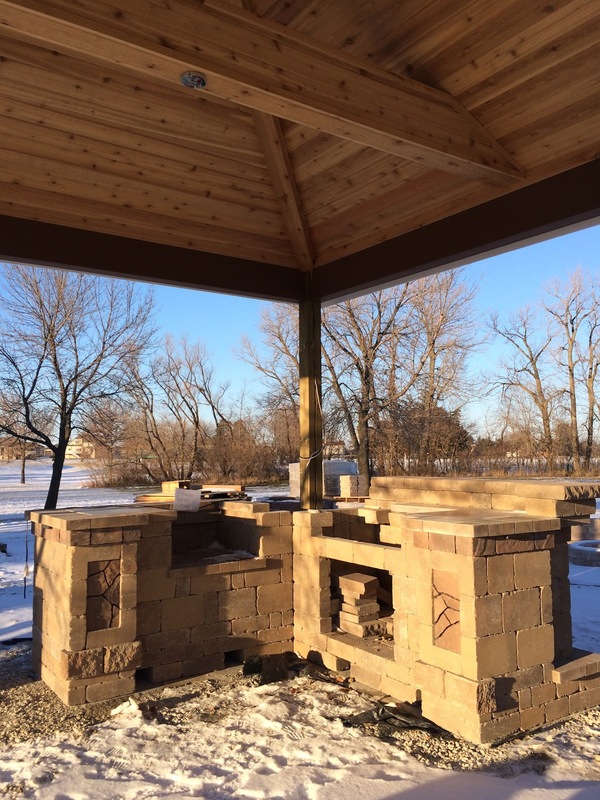 I don’t know…maybe we just turn the heat up to high on the outdoor kitchen grill once it gets in, add some coals to the Big Green Egg fire and some extra logs on the firepit fire and try to create a bubble of warm air over the Bentrott’s backyard so we can get their project completed. Then again, we don’t want to get that friendly with the Huxley Fire Department. I was reminded today that I’m not blogging enough. 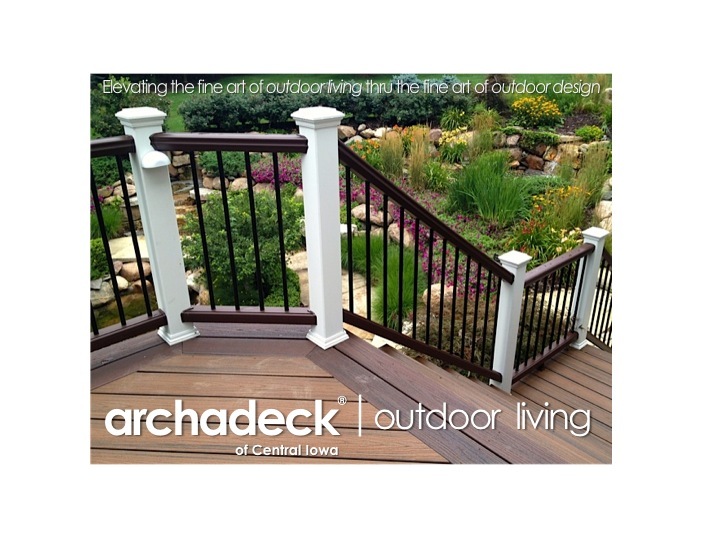 A potential Archadeck client was looking over one of our outdoor living brochures during the design consultation I was having with her on her aging deck in her beautiful Des Moines-area backyard. “Oh, do you blog?” she asked. I replied, yes…but, not enough. She suggested I write a sentence or two each day. I told her that Facebook and Twitter are better suited for that type of approach (and we’re there, too), but nonetheless…she was correct. 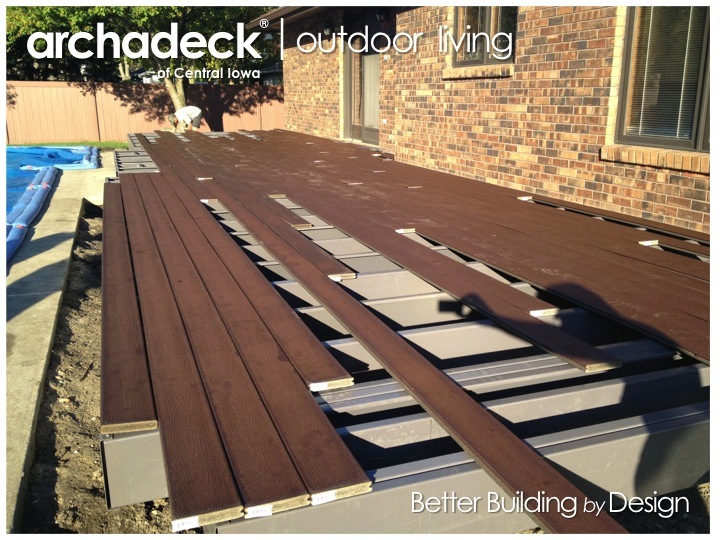 All that to say, I have a lot to write about regarding our many deck, porch and patio projects around Central Iowa this hot and dry summer of 2013. 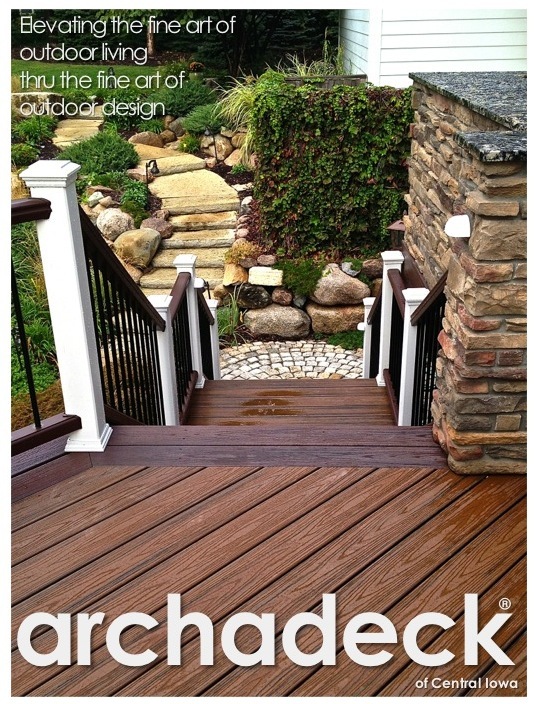 The keyword there is “many.” Which translates to not enough time to actually write about the projects themselves or the outdoor living trends and technologies we’re incorporating into the designs of our outdoor living spaces. At least not now. But, her comments were valid…as was my response. 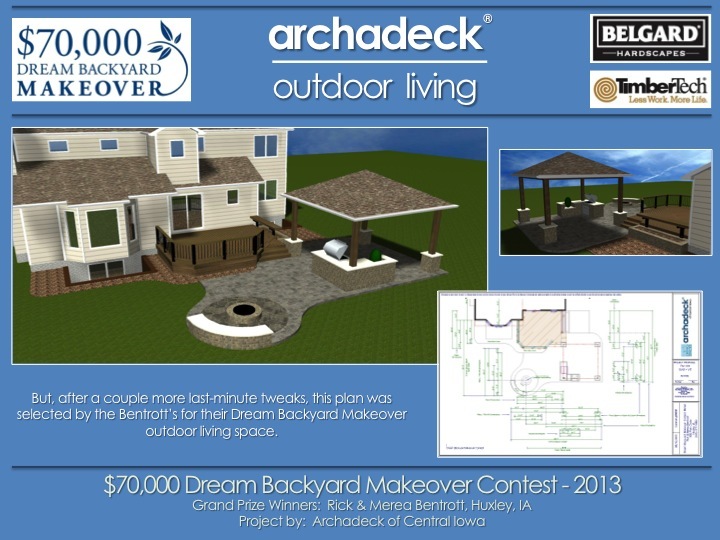 So to that point, our $70,000 Dream Backyard Makeover project deserves time and a couple of sentences. 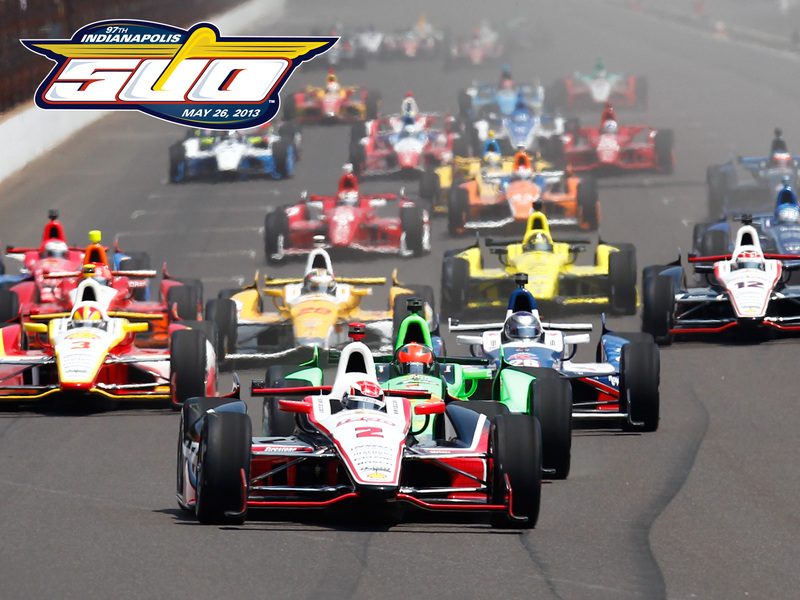 Here…and on Facebook…and on Twitter. 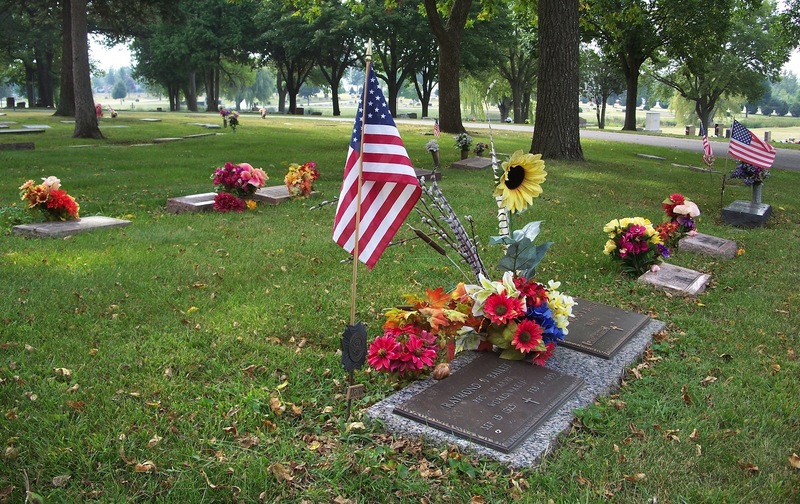 We just broke ground on the project this week. And with that, I am planning to post (already have posted!) regular updates on our status there via our Facebook page. So, follow progress on this project there; after all, this was a Facebook-based contest. Plus short-burst text and picture/video updates on things like this (and your cat’s most recent antics) are tailor-made for Facebook. I’ve put together a photo album as a journal of the construction process: I’ll update it regularly and will continue to post pictures and videos on our wall there. 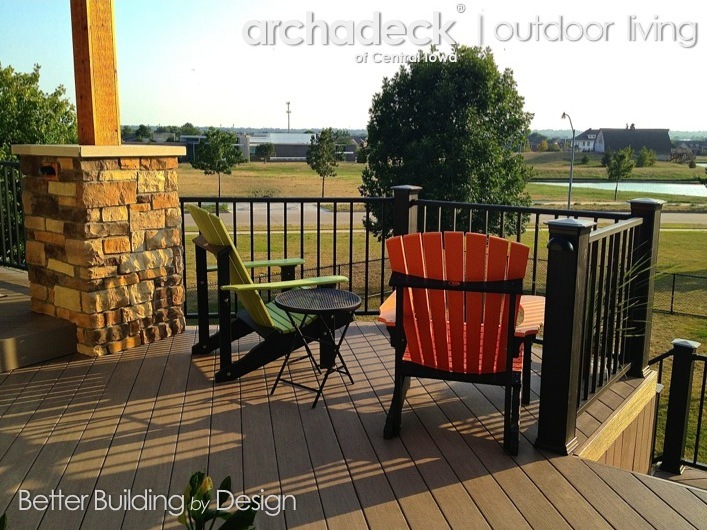 Thanks for checking in here on all things Archadeck | Outdoor Living. 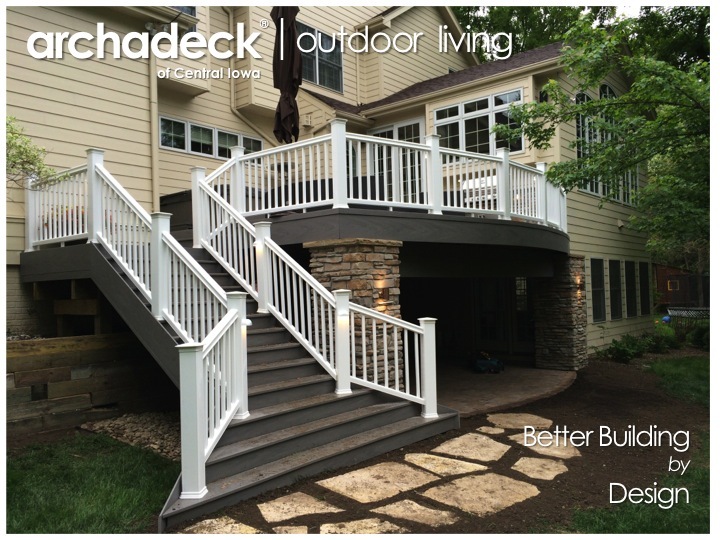 The Bentrott’s Dream Backyard Makeover project isn’t the only thing (but certainly one of the nicest) – there are other things going on in other Archadeck backyards around Central Iowa. 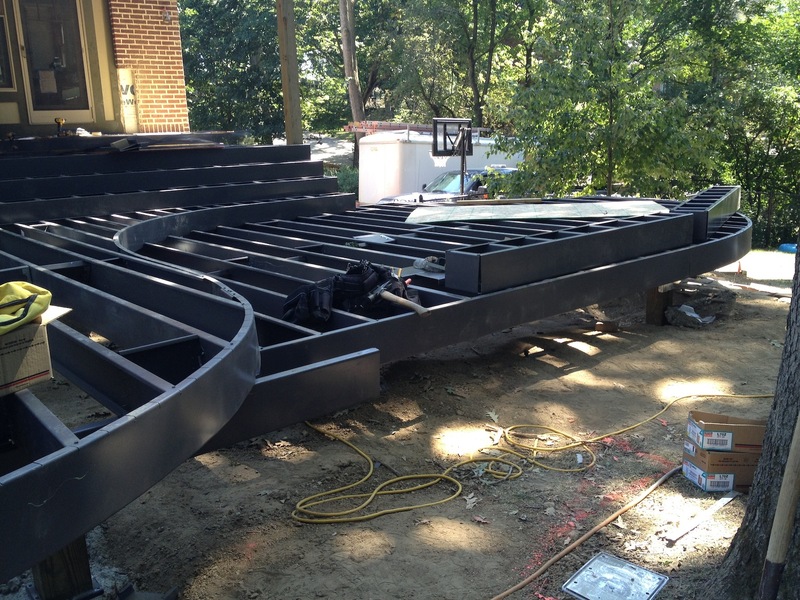 Curved decks and steel framing to name a couple. For the next time. 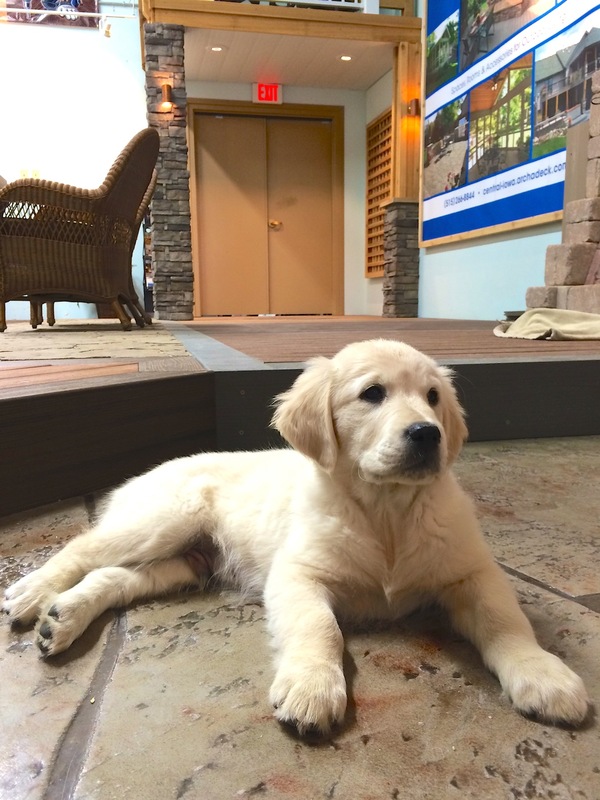 In the meantime…Go Outside and Play! Play football! 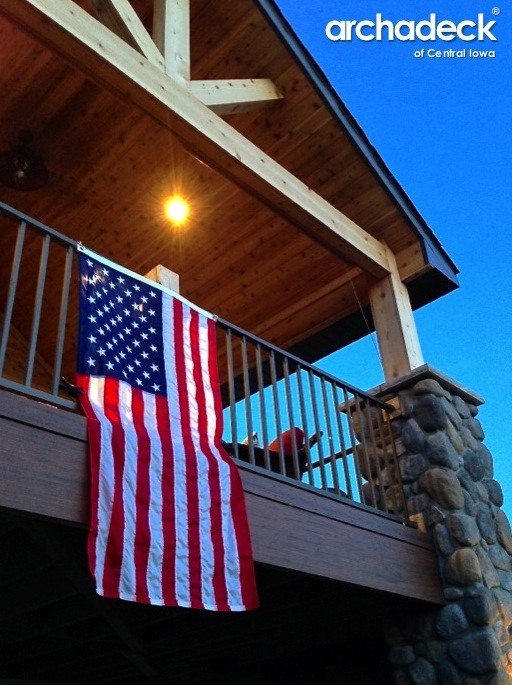 Tailgate at home on your deck or patio! Just like we hope to do with the Bentrott’s in a few weeks!